The Master of Science in Foreign Service (MSFS) launches New Scholarship for Students from Africa. 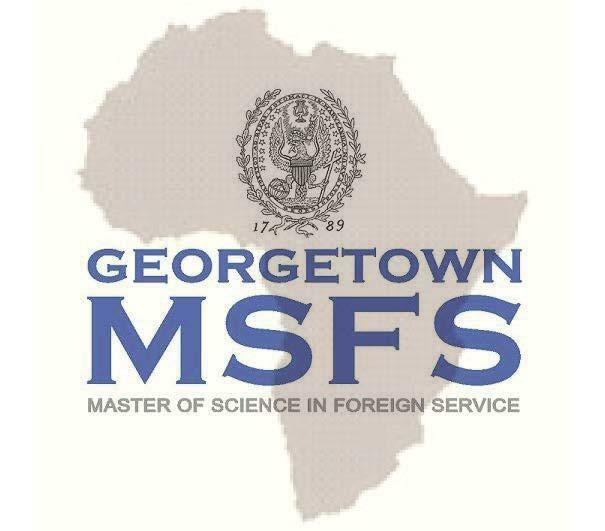 Starting in fall 2014, the Master of Science in Foreign Service (MSFS) at Georgetown University is offering a full- tuition scholarship every year for a talented graduate student from sub-Saharan Africa. MSFS is a two-year, full-time graduate degree program in international affairs. Students will take courses in international relations, international trade, international finance, statistics and analytical tools and history. In addition, students choose an area of concentration such as International Relations and Security, International Development or International Business. A completed undergraduate degree from an accredited university with a strong academic record. Applicants must have completed a course in microeconomics and a course in macroeconomics, or must be able to complete both courses *before* the beginning of the MSFS program in fall 2017. Citizens of sub-saharan African countries ONLY. Special consideration will be given to applicants from: Côte d’Ivoire, Ghana, Kenya, Liberia, Nigeria, Senegal, South Africa. Master of Science in Foreign Service (MSFS). Graduates of MSFS find that the curriculum and faculty prepare them not for a specific job—but rather, for evolving careers that often span all three international sectors: public, private and non-profit. For more information on the academic program, visit msfs.georgetown.edu. To be considered for the scholarship, applicants must submit all required application documents (online application, personal statement, official transcripts and test scores, letters of recommendation). Only students who have applied to the program will be considered for the scholarship. For information on how to apply, visit the official website (link to it is below) for detailed information and appliction procedure. Non-U.S. students have equal access to admission and MSFS scholarship: there are no quotas for specific countries and all nationalities are considered for scholarship. In the "How to apply" section you will find guidance on standardized testing for non-native speakers of English, and the "Financial Aid and Expenses" section has links to information specifically for international students. The MSFS Program welcomes responses and questions about its website, its requirements, its admissions policies, or any other aspects of the Program.